"My tastes are fairly catholic. It might easily have been Kai Lung or Alice in Wonderland or Machiavelli -"
". . . Do you find it easy to get drunk on words?" Last night was remarkable for two terrific explosions which woke us at 2 a.m. and frightened us out of our wits. People have various theories of what they were - Zep[pelin] bombs, mines being exploded or our own guns a field or two away. The whole building trembled and rattled with the vibration. Have been feeling thoroughly nervy all day, silly fool that I am. Evacuated nearly all patients, so had half day off duty and spent it at Mont des Cats with Miss Congleton. Delightful sunny day with splendid views all over Pop[eringhe], Ypres, Vlamertinghe. A Roman Catholic padre left his binoculars us, so we had a wonderful clear view beyond La Bassée, and the colours of the sky at sunset were glorious. As it got dark we saw them sending up coloured rockets from the aerodrome. . . Shells were bursting over our trenches south of Ypres. The picture was vivid, and the huge volume of smoke and muck shot up into the air gave a suggestion of what was happening to our Tommies. All the time the khaki-coloured ambulances were creeping to and fro, bringing the wounded in. This was one of the books that Mary Robinette Kowal cited as background reading for Ghost Talkers, and I put it straight on to my reading list. I've read only one other diary from World War I (as opposed to memoirs), and it was also from a nurse, the American Helen Dore Boylston's "Sister." Like Boylston, Edith Appleton was a trained nurse, though she had years more experience before she joined Queen Alexandra's Imperial Nursing Service Reserve. A month later, she was at her first posting in France, and by February she had moved to the front. She served in hospitals and casualty stations across France and Belgium. After the Armistice, she remained to help with the transport of convalescent soldiers. The diary she kept was apparently sent home on a regular basis to her mother. In 2008, her family built a website to honor her memory, and the publication of her diaries followed. It is clear from the entries just how hard Appleton and the other nurses worked, and how exhausted she often was. The exhaustion wasn't just physical either. Appleton took every chance she could to get away from the work, noting long walks and picnics, and writing about the "splendid views" and the scenery around her - as well as the contrast with the columns of "smoke and muck" and the long lines of wounded and dead. She appreciated simple comforts where she found them, sharing biscuits and chocolate with a friend on a walk, relaxing with a book for a few minutes. When she was assigned to a unit temporarily housed in a wing of a "lunatic asylum," the director offered the nurses the use of the patients' bathroom. I don't fancy bathing in company, but since I have not sat in water deeper than an inch since last year, the temptation is great. . .Three of us went up to another part of the asylum at 7 a.m, and had a deep BATH! Up to our necks in water - glorious! A dear old nun came trotting in when I was in my bath and felt to see if the water was the right heat. She thought the bath was too full and pulled the plug by a patent in the floor. I was sitting on the hole where the water runs away and was sucked hard into it! Even more than a century later, it is difficult to read about the suffering of Appleton's patients. She didn't go into gruesome detail, perhaps because she was writing for her mother, but she didn't gloss over things either. She recorded the first use of gas in the trenches, and its effects on the men coming in to her ward. She noteed the deaths of individual patients who somehow stood out amidst all the carnage. She tried to give them all a clean handkerchief, because that small thing brought them great comfort. 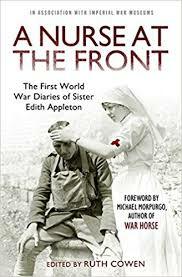 This is not a comfortable book to read - and it shouldn't be - but it is a wonderful record of one part of the Great War by a brave, observant and compassionate woman. This sounds really, really fascinating. I've been wanting to learn a bit more about nursing in the first World War actually -- it sounds absolutely brutal before they even had antibiotics. Yes, patients keep dying of gangrene - gas gangrene, actually, which sounds even worse. But she was also working with a doctor who was working on prosthetics, including facial work for the first time. This sounds interesting. I always want to read diaries even if the subject matter isn't comfortable. I have to set this one down after a while, it's just so sad to read about all the patients she is losing. She gets sad sometimes too - but she doesn't give up, she carries on to help those she can. I love reading books in diary form. This one sounds amazing. I have the diary of a woman doctor in the US Civil War on my TBR stacks - it might be interesting to compare and contrast! I've read quite a few diaries by WW1 nurses but hadn't heard of this one, it sounds right up my street. Thanks. I will be keeping an eye out for more. I did a quick search through the library catalogue but didn't find any easily available here. Thank you for taking the time to read, and to comment. I always enjoy hearing different points of view about the books I am reading, even if we disagree! It would be TBR 278 (this is bad). My 2019 goal: Adding no more than 12 books to the TBR stacks. I failed miserably at this goal in 2018, adding 55 books to the stacks.